Murder by Gaslight: The Long Island Murders. 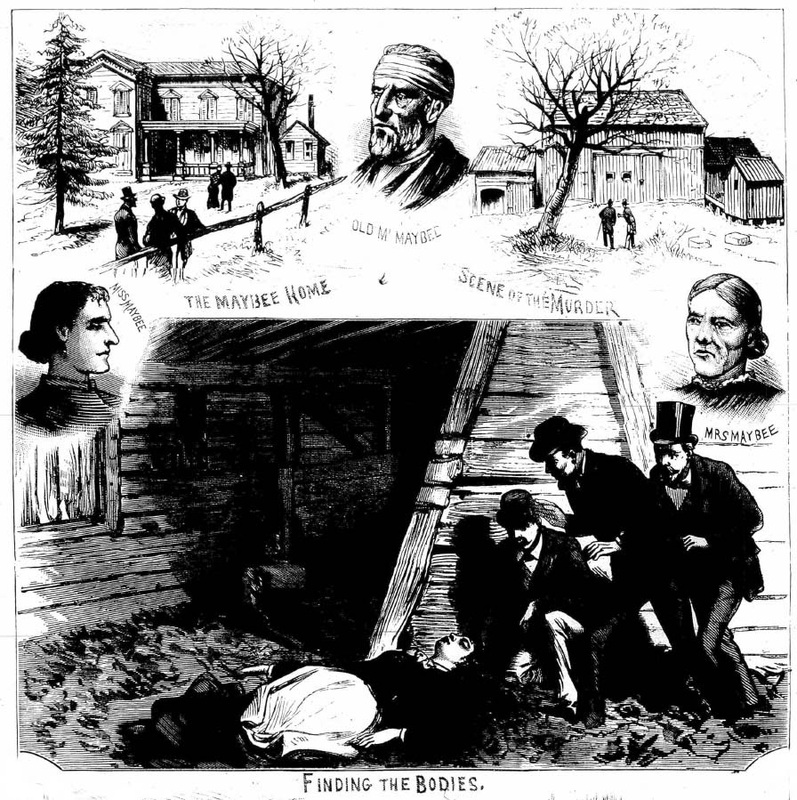 A series of violent home invasions in and around Brookville, Long Island in November 1883 and the months that followed left two people dead and four more seriously injured. The normally serene farming community was thrown into a state of confusion with at least a dozen false arrests, two perjured eye-witnesses, a false confession, lynch mobs, a jail break, and for a time, two independent and equally valid lines of inquiry that could not be reconciled. The evening of November 17, 1883, Israel Baxter was walking past the home of his neighbor, Garret Maybee, in the little farming community of Brookville, Long Island, when he heard cries of distress. Knowing he could not help Maybee by himself, he hurried to alert his other neighbors. Soon half a dozen sturdy farmer were hurrying to the Maybee house, armed with shotguns, spades and other makeshift weapons in case they confronted an intruder. Garret Maybee, 73 years old, was paralyzed from the waist down due to a stroke ten years earlier, and for the past two years he had been totally blind. The men found him sitting in his invalid chair, barely conscious and bleeding from several cuts on his head. He was moaning about his poor wife and daughter; they were not in the house so some of the men went to the barn to look for them. There they found the bodies of Garret’s wife, Lydia Maybee, age 73, and their daughter, 39-year-old Annie, in a corner of the stable, covered with leaves. They had both been strangled. The community was shocked by the murders and the Board of Town Officers offered a $500 reward for the arrest of the killers and the Queens County Board of Supervisors added another $500. Suspicion first fell on a tramp who had been seen in the neighborhood and who often slept in the poorhouse a quarter of a mile from the scene of the murder. Reports of a suspicious looking man who answered the description of the tramp boarding a train for Brooklyn sent detectives there to investigate. Two days after the murder two suspects were arrested in Brooklyn and two more on Long Island. 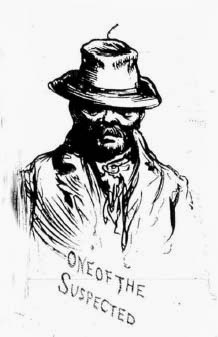 One of the Long Island suspects, James Doyle, who was born in Brooklyn, was identified by Mr. Maybee’s son-in-law as the tramp who had been seen in the area and his shoe matched a footprint found near the barn. Another of the arrested tramps, John Brown, claimed that Doyle had shown him the bodies of the two dead women. Miraculously, the blows to Garett Maybee’s head restored his eyesight, but this did not help in identifying the assailant. He did listen to the voice of James Doyle who was told to say “Me” and “I will kill you.” Maybee identified Doyle’s voice as that of the man who had assaulted him. Doyle was shown the bodies and although he recognized the women, swore he had never been in the barn and did not kill them. An inquest was held, and while a net of circumstantial evidence was tightening around James Doyle, the authorities were not convinced that he was the killer. The thief had gone straight to two drawers containing money and Mrs. Maybee’s jewelry. The thief took $100 in cash, a cameo brooch, and Mrs. Maybee’s watch. The fact that he knew exactly where to look and that he knew Mr. Maybee had a watch as well made them suspect someone who was familiar with the house and the family. Maybee’s son-in-law, William Simonson, together with officials from the Long Island Railroad, contacted the Pinkerton Detective Agency who sent detective James Wood to investigate. Meanwhile, James Doyle was able to prove an alibi and was released from custody. The inquest ruled that Lydia and Ann Maybee were strangled by a person or persons unknown. Detective Wood believed that the attack had been motivated by revenge rather than theft and was making quick progress with his investigation. While he was not ready to give the name of the murderer, on December 6 he told the press that an arrest was imminent and the killer was someone familiar to the household, who visited almost daily, and had even attended the funeral of the victims. Local police, however, were still arresting tramps and at least two more were held until they could prove alibis. The investigation was hindered by a severe snowstorm and a month passed with no announcement from Detective Wood. Then on January 7, 1884 another attack occurred at a home just three miles from Maybee’s farm. Mr. and Mrs. James C. Townsend, a prominent elderly couple of Oyster Bay, Long Island, where found unconscious on the floor of their kitchen, each with severe head wounds. Mrs. Townsend, whose wounds were less serious than her husband’s, was able to talk to the police, but her information was withheld from the press. From the neighbors, reporters learned that Mrs. Townsend had said that an African-American man named Simon Rappelyea had come to collect money for washing that his wife had done for the family. When she turned to get it he hit her on the side of the head. Simon Rappelyea was arrested soon after. Between the Townsends home and the cottage of Simon Rappelyea, the police found a stonemason’s hammer and a pair of bloodstained overalls. The hammer and overalls were traced to John Tappan who was then arrested on suspicion. John Tappan’s brother Edmund was also brought in for questioning. Edmund had been one of the men who responded to Garett Maybee’s distress calls and had testified at the inquest—he was also Detective Wood’s prime suspect and had been under surveillance for several weeks. Under questioning Edmund Tappan admitted that his brother John had murdered the Maybee women. To unburden his conscience, Edmund dictated his story to his friend Halstead Frost; it was signed by Edmund and notarized. He claimed that John strangled Mrs. Maybee then he told Edmund that he would wait for Annie and strangler her as well. When that was done he went into the house, took the money and jewelry and when he came out he gave Edmund $10. John Tappan denied involvement in both the Maybee murders and the Townsend assaults but he was known to have done work for Mr. Maybee and knew the layout of the Maybee house. The Tappans became the prime suspects and Simon Rappelyea was released from custody. Unburdening his soul did not have the desired effect for Edmund Tappan, after giving his statement he went into convulsions and became seriously ill. Unofficially it was believed that Edmund Tappan was the perpetrator of both crimes with the help of someone other than his brother. Then on January 25 another assault changed the game again. Around 7:00 am, Mrs. Sealey Sprague was surprised in her kitchen by a masked man who demanded money. She tried to rush past him but he grabbed her by the hair and knocked her down. He demanded money again and she gave him thirty-eight dollars. Mrs. Sprague could see beneath his improvised mask that the man was African-American. When he left she ran for help and Farmer Petit and his son hurried to her aid. They found Mr. Sprague by his barn unconscious, lying in a pool of frozen blood. He had been hit in the head with a railroad “strap”— a piece of iron used to connect rails. It was not hard to follow the assailant’s footprints in the snow and they tracked him the village of Westbury where he stopped to buy some crackers and cheese. The owner of the store had been notified to be on the lookout and managed to keep him in the store until the police arrived. The greatest challenge for the police was keeping the man from the hands of a lynch mob. According to the New Haven Register, “The colored people were as bitter against him as the white,” and the angry crowd was noticeably integrated. The officers were able to wrest him from the mob and took him to Gottert’s Hotel in Hicksville where another angry mob soon gathered. At 8:00 that night they managed to get him on board a milk train to Long Island City where he was taken to the Queens County Jail. The man was Charles H. Rugg of Oyster Bay, Long Island. After a day of denying involvement in any of the crimes, Rugg broke down and confessed to the Sprague assault. He was questioned about the other crimes as well but the police absolutely refused to release any information given on the interrogations. It was known that Rugg had worked on the Maybee’s farm in the past but Garrett Maybee did not think he was the killer. Rugg had worked there before Maybee went blind and he had never been inside the house; he would not have known about Maybee’s blindness or known the layout of the house. He did not think Rugg was strong enough to overpower his daughter. Maybee now believed the voice he heard had been Edmund Tappan and that the murders were committed by Tappan and an accomplice. While Rugg was being questioned, an inquest was being held on the Townsend assaults and the Tappans were still the prime suspects. Edmund Tappan broke down in tears on the witness stand and it was commonly believed that police questioning had driven him insane. At present the extraordinary situation exists of two prisoners held for each of two crimes— Rugg and Edmund Tappan in one case and Rugg and John Tappan in the other—against every one of whom sufficient evidence exists to secure convictions, while there is not the slightest evidence and scarcely a possibility that they were accomplices. While in jail, Rugg appeared to be ailing and was under a doctor’s care. The night of February 17 he was shaking violently and his jailer, John Murphy, mixed some medicine prescribed by the doctor and brought it into Rugg’s cell. When Murphy turned to leave the cell, Rugg jumped him and knocked him down than ran through the open cell door. He grabbed Murphy’s revolver and club and escaped the building by jumping out of a second story courtroom window. Rugg was at large for three days before being captured in a church in Woodside, Long Island. Edmund Tappan finally told the Grand Jury that he had made up the confession and accusations against his brother. He had lied in hopes of getting the reward money which had grown to $2,800. There was now little question that Rugg had committed all three crimes and the Grand Jury handed down seven indictments against him—two for first degree murder, four for assault and robbery, one for burglary. Unofficially he was also being considered as a suspect in the unsolved murder of Rose Ambler in Connecticut. Chalres Rugg was tried for the murder of Anne Maybee first; should he be found not guilty, the prosecution was ready to try him again for Lydia Maybee’s murder. 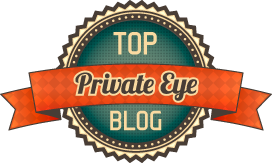 Garrett Maybe, who had lost his eyesight once more, gave heart wrenching testimony as to the events of November 17, while his doctor sat by his side, holding his pulse to make sure Mr. Maybee did not become overly excited. He did not give his opinion as to who committed the murders, but under gentle questioning by the defense he admitted that he had first identified the voice of John Doyle. Rugg was defended by ex-judge Richard Busteed and John F. Quarles, an African-American attorney who had also represented both Simon Rappelyea and John Tappan in preliminary hearings. They tried to introduce Edmund Tappan’s confession as evidence but the judge would not allow the confession of any mention of it. The jury deliberated for just over an hour before returning a verdict of guilty. There were numerous claimants to the reward money offered for the capture of the Maybee murderer. A score of citizens ran down Rugg in Westbury the day of the Sprague assault, each requested an equal share; detectives from Roslyn, Flushing, Mineola, and Oyster Bay requested shares for working the case; other residents of Oyster Bay and Glen Cove wanted shares for contributing information; detective John S. Wood, who worked hardest on the case was precluded from receiving a reward due to his position with the Pinkerton Agency. The matter was probably settled in court. 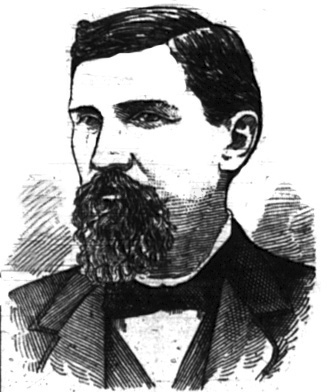 Charles H. Rugg was hanged inside the jail in Long Island City on May 15, 1885. Sheriff Furman limited attendance to a couple hundred of his friends and relatives and he excluded members of the press because he felt they had not given him the credit he was due in their reporting of the case. Rugg had been converted to Catholicism before the execution and went stoically to the gallows. Reportedly, he was reciting “Hail, Mary,” when the sheriff cut the rope to spring the trap. Rugg’s neck was broken and he died instantly. "The Alleged Murderer." New Haven Register 20 Nov 1883. "Another Long Island Tragedy." Cincinnati Commercial Tribune 9 Jan 1884. "Brookville's Horror." Truth 21 Nov 1883. "Charles Rugg Escapes ." New York Herald 18 Feb 1884. "Clamoring for the Reward.." New York Herald 27 Apr 1885. "A Horrible Confession.." Boston Journal 18 Jan 1884. "Garrett Maybee Testifies.." New York Herald 24 Apr 1884. "How Rugg Was Recaptured.." New Haven Register 21 Feb 1884. "The Long Island Murders." New York Herald 29 Jan 1884. "The Long Island Tragedy-the Murder Probably Caught." Boston Journal 20 Nov 1883. "Long Island's Strange Crimes Extraordinary Conflict of Evidence in the Maybee and Townsend Cases." New York Herald 3 Feb 1884. "Mason Tappan Arrested The Owner of the Hammer and Overalls Charged with the Townsend Outrage." New York Herald 16 Jan 1884. "Maybee." Truth 1 Dec 1883. "The Maybee Murders ." New York Herald 25 Jan 1884. "The Maybee Tragedy." 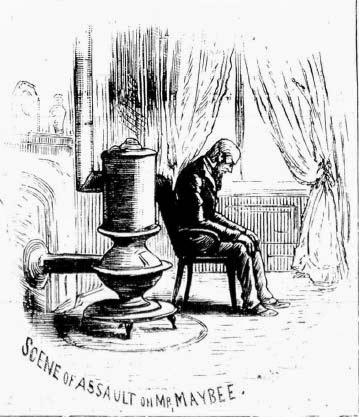 Philadelphia Inquirer 22 Nov 1883. "Murder Most Foul." National Police Gazette 8 Dec 1883. "Points for the Tramp." New York Herald 23 Nov 1883. "Robbery the Only Motive." New York Herald 9 Jan 1884. "Rugg Guilty of Murder.." New York Herald 26 Apr 1884. "Rugg's Neck Broken.." New York Herald 16 May 1885. "Strangled to Death." New York Herald 18 Nov 1883. "The Strangled Victims." New York Herald 20 Nov 1883. "Struck down in His Barn." New York Herald 26 Jan 1884. "The Tappan Brothers." New York Herald 21 Jan 1884. "Tappan Cries in Court." New Haven Register 28 Jan 1884. "Wife And Daughter Killed." New York Tribune 19 Nov 1883. I lived in this house from 1997-2002. I swear to you it was haunted. I remember taking a nap around 3pm and someone tapping my shoulder. I woke up and there was nobody there. Then one time I was asleep and my body was raised up in the air, then I dropped down to my bed. Honest to God. More Scenes from the Burdell Murder.